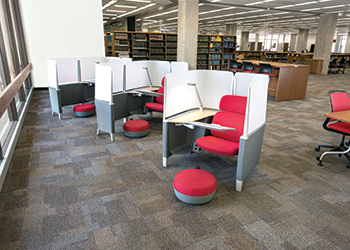 Brody WorkLounge ... its adjustable work surface holds technology at eye level. Steelcase has designed a range of office chairs and desk systems to counteract the ill effects of prolonged sitting, adapting to the ways people work today. Among the products it has launched to meet the needs of today’s work environment are the Ology Bench, Gesture with Headrest and Brody WorkLounge. Hence, Steelcase’s latest innovations address the need in modern offices for new designs and furniture to better accommodate these new positions, promote creativity and support employee wellness. Elaborating on the latest products, the spokesman says: “Ology Bench is simple, efficient and highly adaptable to support new, more flexible work styles. It allows workers to customise their work environment based on their preferences, provides sufficient legroom and offers space division for privacy, lighting, power and work tools. “Gesture with Headrest is the first office chair to support a greater range of technologies, postures and user sizes. Delivering an entirely new sitting experience, Gesture’s intuitive engineering sees it adjust to nine new postures that best accommodate our daily interactions with technology. Meanwhile, Brody WorkLounge, featuring patented LiveLumbar technology, brings thoughtful ergonomic design to the lounge posture. The adjustable work surface holds technology at eye level, reducing neck and shoulder strain. Octagon ... created with TitanCeram material. 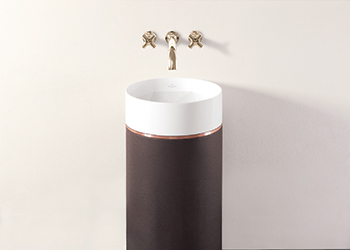 With its Octagon column bathroom sink, ceramics major Villeroy & Boch (V&B) has created an exclusive and innovative premium product that provides exclusive luxury, both in material and design quality. Designed in-house by Kai Steffan, Octagon has been created with the new TitanCeram material from Villeroy & Boch and innovative manufacturing processes. It combines precise edges and angles in the bowl to form an octagon and resembles a polished crystal, thanks to its finely worked facets. Together with the high-quality surface covering the free-standing column, Octagon is the absolute design highlight for any bathroom, according to V&B. TitanCeram is a new material developed by V&B for specific use in high-quality premium designs. It enables the company to produce sanitary products with exceptionally precise forms, extremely thin walls and sharply drawn edges. It is made from a combination of clay, quartz, feldspar, pegmatite and titanium dioxide. “The octagon, the symbol of perfection since antiquity, is uniquely placed in a ceramic form in our Octagon bathroom sink,” says a spokesperson for Villeroy & Boch. Octagon’s impressive column comes in an exclusive selection of high-quality covers that include real wood veneer Dark Chestnut, the extravagant Smoky Slate stone veneer, the elegant leather-look Mocha Finish and a fine leather finish available in two colours: Mocha Leather and JetBlack Leather. Petals’ Quatrefoil configuration ... exotic. 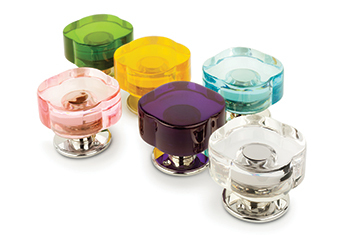 Luxury architectural hardware manufacturer Haute Déco has launched the Petals range of doorknobs. Designed to fit the hand through careful calibration of its interlocking circles, the doorknob’s perfect proportions make it elegant and delightfully comfortable to use, says a spokesperson for the UK-based Haute Déco. Petals doorknobs can be ordered in two configurations, each with its own, particular vibe: the Quatrefoil configuration being more exotic, whilst the more classic square setting bears a stylised floral connotation, he says. Made relevant to today’s living by its pure lines and contemporary material, Petals is made of Cristalle resin, a modern-day material perfected over time at Haute Déco’s workshop in southwest England. “This tactile ethereal material is soft to touch yet remarkably hard-wearing, and lavishly polished to achieve a lustrous softness reminiscent of cabochon semi-precious stones,” says the spokesperson. “One of those rare designs that we instantly recognise as making perfect sense – like something we always expected to exist but never actually encountered – Petals has all the makings of a new classic. “At the core of this new generation of doorknobs is a jewellery-grade metal insert, which has been re-engineered to be a fitting match for Haute Déco’s door jewellery concept. The gentle sparkle of its delicate cross hatching detail is reflected around the knob’s flowing arches,” he adds.